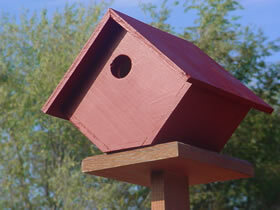 Basic wren bird house. Each house is individually hand decoreated on top of your base color choice. Dimensions: 5 3/4" x 6" x 7 3/4" Weight 1.2 lbs. Screw eye option includes 2 screw eyes installed in the roof of the house which allows you to hang in a tree or under the eave of a house. Price $9.95 Add $5.00 for cedar, copper or shingled roof.